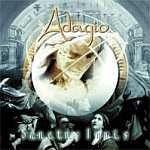 Review: "Adagio: Sanctus Ignis" - Sea of Tranquility - The Web Destination for Progressive Music! Sometimes forming objective opinions are always better on the second try. Have you ever seen a movie twice and reached two completely different opinions? Such was the case with Adagio’s SPV release Sanctus Ignis. On the first pass, it was easy to draw immediate comparisons to another great classical prog-metal band, SymphonyX. The operatic song structures, speedy guitar work, ethereal background choruses, and Euro/Middle Eastern flavorings, almost led me to dismiss it as a well-made S-X clone (even though that in itself, wouldn‘t be all bad). However, when I set down for repeated listens recently, I was unprepared to appreciate the talent behind this great disk. The talent behind Adagio is lead guitarist/keyboardist/songwriter Stephan Forte’. Forte’ is from France and has been hailed as a guitar prodigy. France isn’t known for their metal exports, but judging by his playing on Santus Ignis, Forte’ just might be the best metal guitarist in the country. At 25 he’s a monster player, composer, and multi-instrumentalist, who can give most of his contemporaries a run for their money. Forte’ shreds with conviction and precision that evokes a little bit Malmsteen, a little bit Holdsworth, and probably some other guitarists I didn’t recognize. Although Forte’ is not afraid to play up to his influences, he does add his own tasty hooks and signature to make each piece his own. Make no mistake though; this album is not a simple guitar fest. Backing Forte’ is a collection of seasoned musicians; Majestic’s Richard Andersson on keys, Elegy’s Dirk Bruineberg on drums, Frank Hermanny on bass, and from the German band Pink Cream69, David Readman on vocals. Readman also contributed some lyrics to the project while his band mate, Pink Cream 69’s bassist Dennis Ward, sat behind the board as producer. Again, as stated before, there is no denying the obvious comparisons to other prog- metal giants. “Second Sight” opens with a moody intro solo reminiscent of Yngwie Malmsteen’s intro on “Caught In The Middle” (Marching Out/Polygram 1985). Other songs contain the same pounding chugga-chugga rhythms so familiar in S-X tunes. But the entire album stands out because of the fabulous performances from all the players involved. Dennis Readman’s powerful vocals match Forte’s stunning guitar work with equal intensity. He growls, he screams, he sings, and he delivers. Although Forte’ performed many of the keyboard arrangements, he left all the soloing up to Andersson, and what a soloist he is. His ballsy approach and tasteful patch selection seamlessly fill the void when the rest of the players back down. Bruineberg’s thundering double-bass work and Frank Hermanny’s bass accompaniment provide the steady rhythm to give each song flight. Special note should go to Dennis Ward as producer. The production sounds great and everything in the mix can be clearly heard. The end result is a massive soundscape of bass, guitar, vocals, piano, bells, organs, strings, samples and drums that gives depth to the entire album. Of the nine songs on the album (plus one bonus track), “In Nomine”, “The Stringless Violin”, and the epic “Seven Lands of Sin” are the most exciting. Both “In Nomine” and “The Stringless Violin” start very similar with baroque sounding intros, and then each tune takes a decidedly different path. “In Nomine” develops into a speedy, straightforward classical metal piece while the latter has a more modern, progressive feel. For those fans who love those ever intense, never-ending, epics like “Metropolis”from Dream Theater or “Through The Looking Glass” by S-X, will certainly enjoy Adigio’s “Seven Lands of Sin.” Clocking in at 11:40 it features performances that showcase the entire band. I was pleased to see not one, but three instrumental pieces, all intricately arranged to show off Forte’s strength as a composer. The most curious tune happens to be an instrumental cover of the Zeppelin classic “The Immigrant Song” with Forte’s lyrical guitar solos subbing in for Robert Plant’s voice. The rest of the songs provide even ballast for a very solid album. Despite comparisons, Santus Ignis is a solid, well- crafted, head- banging album that should appeal to most fans of the classical prog/metal music. Hopefully this lineup can stick together and in the future deliver more intense music. This genre, which was pioneered by Malmsteen and has recently been taken to new heights by bands like SymphonyX, Royal Hunt, and Angra, still has plenty of room for new blood.